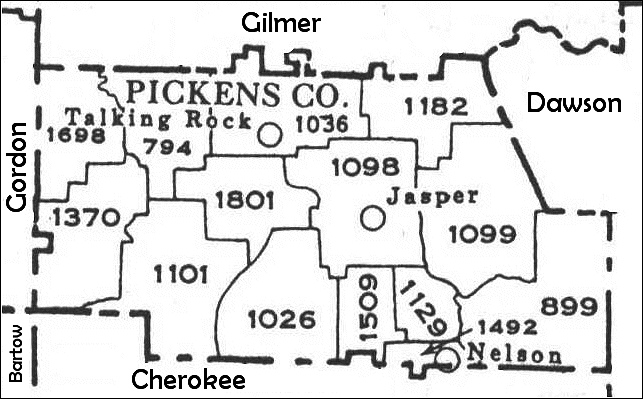 “Pickens County lies at the southern end of the Appalachians in North Georgia. The Cherokee Indians called this area home after they were forced from the Carolinas in the 1770’s. In 1805, the Federal Government forced the Cherokees to accept a road through their lands to Nashville. Portions of the Old Federal Road are still visible in the County today. 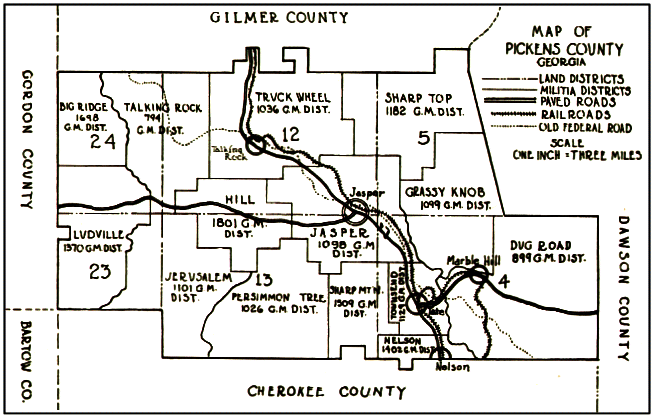 The Cherokee lands were distributed to white men by Georgia in 1832 Land Lottery. The thirst for gold discovered in these lands forced the Cherokees to move westward in the now infamous Cherokee Removal or Trail Of Tears of 1838. 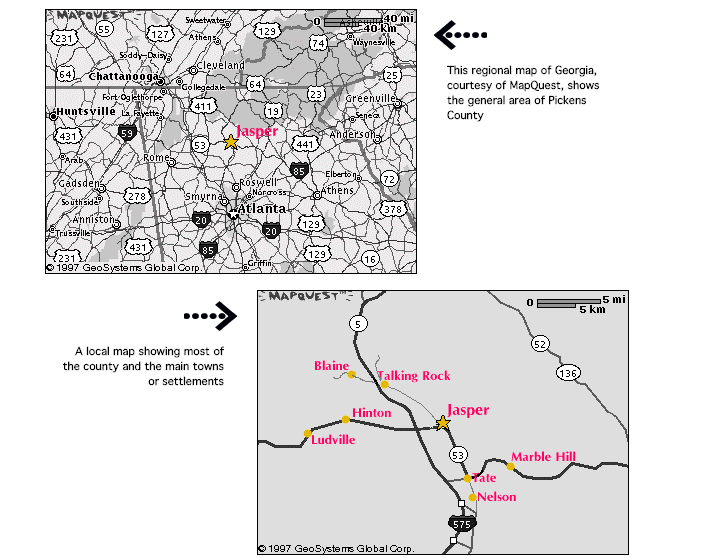 The County was formed from portions of Cherokee and Gilmer Counties in 1853. During the Civil War, some Pickens Countians were pro-Union. For almost a month after Georgia seceded, the Union flag flew from the Court House, but Pickens County sent six companies to the Confederate Army. There were no major battles fought in the County, though some guerilla warfare did occur here. Pickens County is renowned for its exceptionally pure marble. The deposit is five to seven miles long, one/half wide and as deep as 2,000 feet. This marble was known as used by the Indians as early as 800 AD. Henry Fitzsimmons established the first marble quarries and the first marble mill in the 1830’s. The Georgia Marble Company was organized in 1884 and leased all of the Tate Marble lands. The coming of Marietta & North Georgia Railroad into Pickens County in 1883 opened outside markets for Georgia marble. Col Sam Tate became President and General Manager of Georgia Marble Company in 1905. The firm grew rapidly until concrete replaced stone as building material. Georgia marble was used in the construction of many notable buildings, including the Lincoln Memorial, House Office Building, East Wing of the National Gallery of Art, National Air and Space Museum, New York Stock Exchange Annex, Cleveland Federal Reserve Bank, Chicago’s Buckingham Fountain, and Bok Sing Tower in Florida. in the 1997 Marble Valley Historical Society’s calendar. This county was officially created out of the southern part of Gilmer County and the northern part of Cherokee County on December 5, 1853. Here are some “vintage” maps that show the evolution of county lines.